No pictures found for plate number GEU6374 in Ohio, United States. click here to add a picture. No videos found for plate number GEU6374 in Ohio, United States. click here to add a video. 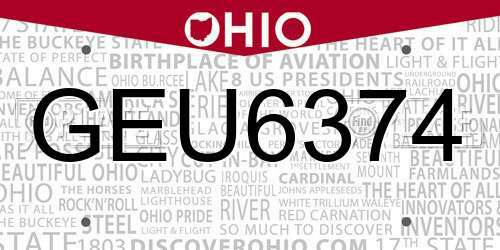 No owners found for plate number GEU6374 in Ohio, United States. click here to add an owner. No related websites found for plate number GEU6374 in Ohio, United States. click here to add a related website. THE NUTS INCLUDED IN THE PACKAGING FOR THESE BALL JOINT ASSEMBLIES ARE MISSING THE INTENDED PREVAILING TORQUE (SELF-LOCKING) FEATURE. IF THE INCORRECT NUT WAS TO BECOME LOOSE, THE JOINING MEMBERS MAY LOOSEN LEADING TO A SEPARATION OF THE BALL JOINT. THIS MAY RESULT IN LOSS OF VEHICLE CONTROL, POSSIBLY RESULTING IN A VEHICLE CRASH. FEDERAL MOGUL WILL NOTIFY OWNERS AND REPLACE THE PARTS FREE OF CHARGE. THE RECALL BEGAN ON MAY 22, 2008. OWNERS CAN CONTACT FEDERAL MOGUL AT 877-489-6659. THIS RECALL ONLY PERTAINS TO AFTERMARKET BALL JOINT ASSEMBLIES AND HAS NO RELATION TO ANY ORIGINAL EQUIPMENT INSTALLED ON VEHICLES MANUFACTURED BY THE VEHICLE MANUFACTURERS.CUSTOMERS MAY CONTACT THE NATIONAL HIGHWAY TRAFFIC SAFETY ADMINISTRATION'S VEHICLE SAFETY HOTLINE AT 1-888-327-4236 (TTY: 1-800-424-9153); OR GO TO HTTP://WWW.SAFERCAR.GOV. ON CERTAIN PASSENGER VEHICLES EQUIPPED WITH 2.4L NON-TURBOCHARGED ENGINES AND AUTOMATIC TRANSAXLES, THE POWER STEERING PRESSURE HOSE MAY CONTACT THE AUTOMATIC TRANSAXLE DIFFERENTIAL COVER, POTENTIALLY DAMAGING THE HOSE. POWER STEERING FLUID LEAKAGE IN THE PRESENCE OF AN IGNITION SOURCE CAN RESULT IN AN UNDERHOOD FIRE. DEALERS WILL INSPECT AND RELOCATE, OR REPLACE AS NECESSARY, THE POWER STEERING HOSE AND CONFIRM TORQUE OF THE HOSE FASTENER AT THE STEERING GEAR END. THE RECALL BEGAN ON SEPTEMBER 20, 2004. OWNERS SHOULD CONTACT DAIMLERCHRYSLER AT 1-800-853-1403. DAIMLERCHRYSLER RECALL NO. D18.CUSTOMERS CAN ALSO CONTACT THE NATIONAL HIGHWAY TRAFFIC SAFETY ADMINISTRATION'S AUTO SAFETY HOTLINE AT 1-888-DASH-2-DOT (1-888-327-4236). ON CERTAIN PASSENGER VEHICLES, THE FUEL PUMP MODULE MOUNTING FLANGE COULD LEAK FUEL IF THE VEHICLE IS INVOLVED IN A ROLLOVER CRASH. DEALERS WILL INSTALL A SECONDARY SEAL OVER THE FUEL PUMP MODULE. OWNER NOTIFICATION BEGAN AUGUST 12, 2002. OWNERS WHO TAKE THEIR VEHICLES TO AN AUTHORIZED DEALER ON AN AGREED UPON SERVICE DATE AND DO NOT RECEIVE THE FREE REMEDY WITHIN A REASONABLE TIME SHOULD CONTACT DAIMLERCHRYSLER AT 1-800-853-1403. DAIMLERCHRYSLER RECALL NO.B23.ALSO, CUSTOMERS CAN CONTACT THE NATIONAL HIGHWAY TRAFFIC SAFETY ADMINISTRATION'S AUTO SAFETY HOTLINE AT 1-888-DASH-2-DOT (1-888-327-4236). 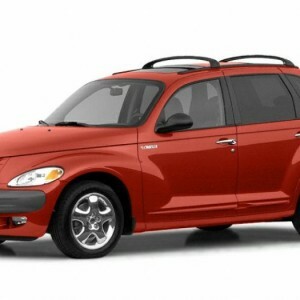 VEHICLE DESCRIPTION: CERTAIN SPORT UTILITY VEHICLES ARE BEING RECALLED FOR A SOFTWARE ERROR IN THE INSTRUMENT CLUSTER MICROPROCESSOR. UNDER CERTAIN CONDITIONS, THE CLUSTER, WITH THE MAJORITY OF ITS GAUGES, ILLUMINATION, AND WARNING LAMPS, COULD BECOME INOPERATIVE. DRIVING THE VEHICLE WITH AN INOPERATIVE CLUSTER COULD CAUSE A DISTRACTION, INCREASING THE RISK OF A CRASH. DEALERS WILL RE-FLASH THE CLUSTER SOFTWARE TO CORRECT THE CONDITION. OWNER NOTIFICATION BEGAN OCTOBER 8, 2001. OWNERS WHO TAKE THEIR VEHICLES TO AN AUTHORIZED DEALER ON AN AGREED UPON SERVICE DATE AND DO NOT RECEIVE THE FREE REMEDY WITHIN A REASONABLE TIME SHOULD CONTACT DAIMLERCHRYSLER AT 1-800-853-1403.